You thought Kenya was all savanna lands and wild animals didn’t you? But, what you might be surprised to know is that it also has more than 300 miles of coastline on the Indian Ocean. To be honest, I really had no idea that it had such magical beaches and crystal clear water! After we did our safari we decided that to head towards the water to have a bit of a beach stay. K loves swimming and I wanted to see a different side of Kenya. We got that! Our destination was Diani Beach, a very popular tourist destination for Europeans. We learned very quickly that not many Americans made their way here, we never saw another American for the nearly six days we were visiting. That’s not a bad thing just a fact! 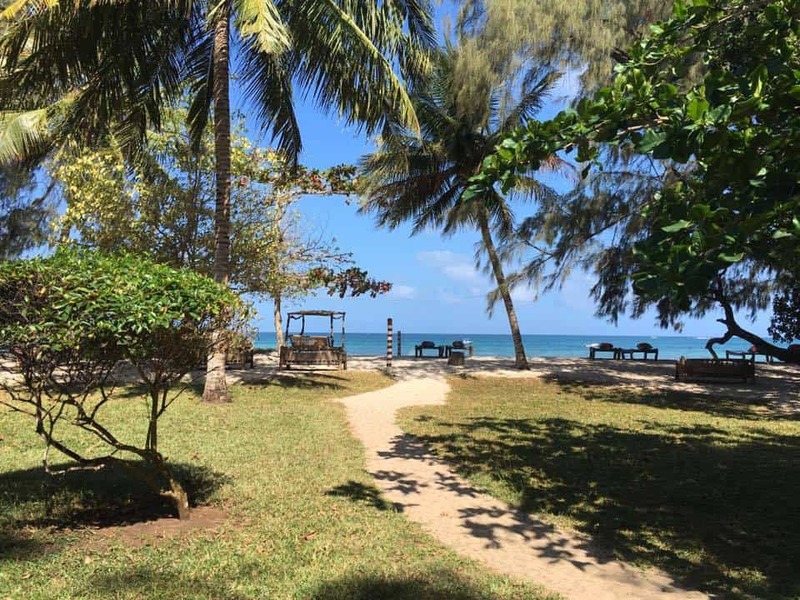 The closest big city to Diani is Mombasa, but it is quite a distance, over 70 kilometers. We both flew to Diani and drove to Mombasa. The airstrip is known as Diani Ukunda. Cars can be hired privately or from your hotel/accommodation. It was about $75USD one way to get from Diani to Mombasa via a hired car and took about three hours time. The one thing I did like about this was that we were able to see more of the real Kenya. If you’re tight on time this could be a deal breaker as the roads can be crowded and delays can occur. It’s possible to fly via an airtaxi. If you’re short on time I think this is a great option. We used these to get around other areas. They are slightly more expensive than a car rental but the time savings is great plus, no need to show up early. One hour before your flight will be ok. Unless you have a lot of time in Kenya, you’ll want to fly from point to point. We flew from Mombasa to Nairobi on our way home. This route can be easily booked online or through a travel agent. If however you decide to fly via air taxi that should be booked through an agent ahead of time. The flight is only about 40 minutes. Note these flights leave from Nairobi WILSON airport not the international airport. As I mentioned Diani is a big tourist destination. You will find dozens of hotels and resorts lining the beach. 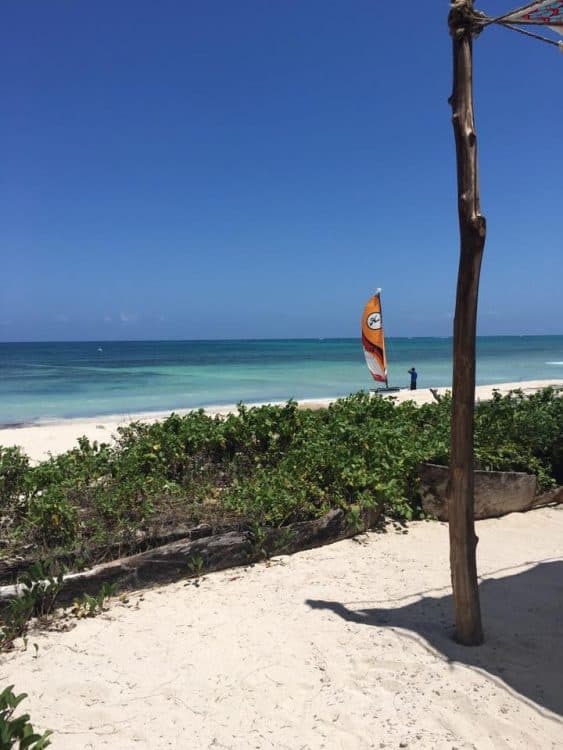 On Diani Beach we stayed at two different resorts; Kinondo Kwetu and The Sands at Nomad. We liked both but I’ll share the pros and cons so that you can make the best decision for yourself or your family. 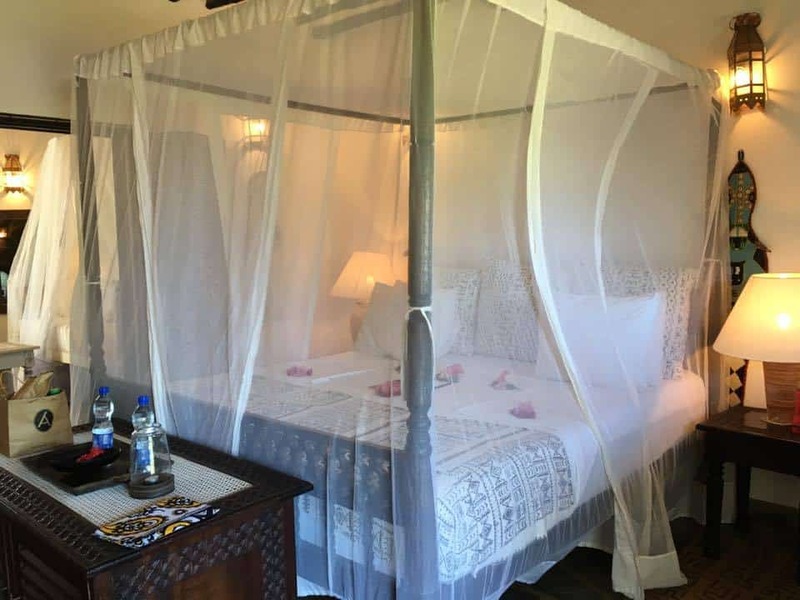 Our first stay was at Kinondo Kwetu and we quickly settled in and felt right at home. One of the benefits of traveling in the off season is there are no crowds. It’s also one of the negatives. Sadly, K didn’t find any other kids to play with during most of our beach time. That meant mom had to bite the bullet! 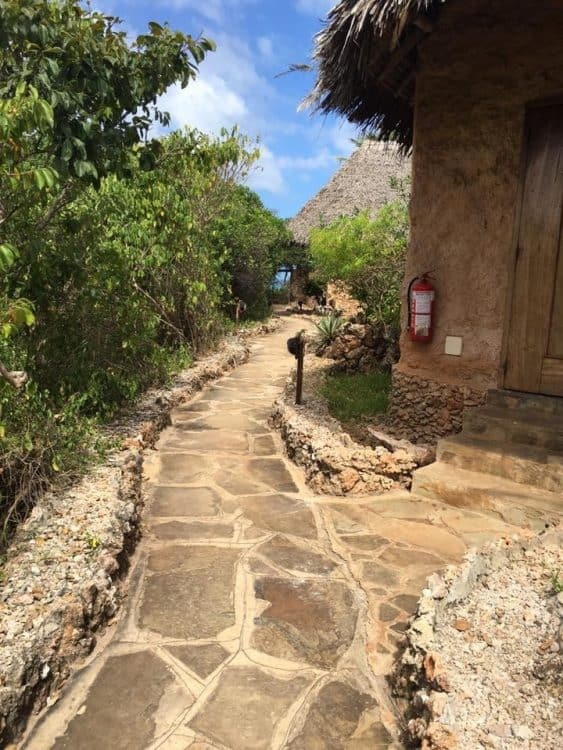 Kinondo Kwetu, like most hotels here is behind tall walls and pretty secluded. We were warned right away about having food in our rooms because..monkeys. Ever look at those pictures of houses in jungle areas that have bars on the windows? That’s not because of robbers, it’s to keep monkeys out. The layout here is open air rooms which is fantastic during the day! You can see the ocean and feel the breezes. We enjoyed breakfast with ocean views and lunch in a traditional boat that had been converted to a dining space. My favorite feature here? Every night your dinner is somewhere else on the property – there’s no fixed dining room. It’s like a little surprise finding out where they’ve chosen to host it! One night we climbed the big water tower that sits above all the property and had a very special meal! K loved taking a horse ride on the beach. The only issue we had was with mosquitos. One night poor K faced a lot of bites even though we were under a net. This could just have been his bad luck but it is one thing to keep in mind. If you’re prone to mosquito bites pack lots of spray, use it liberally and make sure to close up your room as soon as the sun starts to go down. What we loved: The family friendly feel, beautiful pools, and really cool mystery dinner idea all were great! Hints and Tips: You’ll probably want to boo a full board option here as it’s quite far from anywhere else to eat. If you have plans that take you away from the hotel during the day then you’ll have other choices. A quick ride down the road brought us to The Sands at Nomad where we would spend one night before heading to their other property on Chale Island. At first look I wasn’t sure what this hotel was but I was quickly reassured. We had a beach front bugalow with air conditioning. The beach was right outside our window and there were covered lounge chairs to enjoy. The pool was ultra cool with a hollowed center to swim through and comfortable water. We loved the restaurant here because it had loads of choices and great pizza. The only downside here was the nearby shopkeepers and buskers on the beach. We did end up taking a guy up on his offer to take us out in a boat to see some of the wildlife and go snorkeling. After seeing him pull the mouthpiece for the snorkel out of some murky looking water I fiend sickness and we returned to shore. I wouldn’t recommend doing this, book an excursion directly from the hotel. I also had a run-in with some older teenage boys who wanted to be “my friend”. Nope, no, no way. What we loved: the restaurant, pool, and air conditioning! Best for: couples or friends, it was ok traveling with 1 kid but if both + MarocBaba had been with it may not have been the best option. Hints and Tips: Avoid the salesmen hawking excursions on the beach and alert The Sands security if you feel uncomfortable. Wondering what to do in Eastern Kenya? Here are a few ideas! Snorkeling & Scuba – most resorts have scuba and snorkeling options. You can also head to Diving the Crab for lessons and rentals as well as booking tours to dive or snorkel further out. Swimming – It is the beach after all! The Indian Ocean has crystal clear water and plenty of gorgeous sand beaches to spend your day splashing in the water. Day Safaris – If you don’t make it to the Masai Mara there are still safaris closer to this area that you can take. 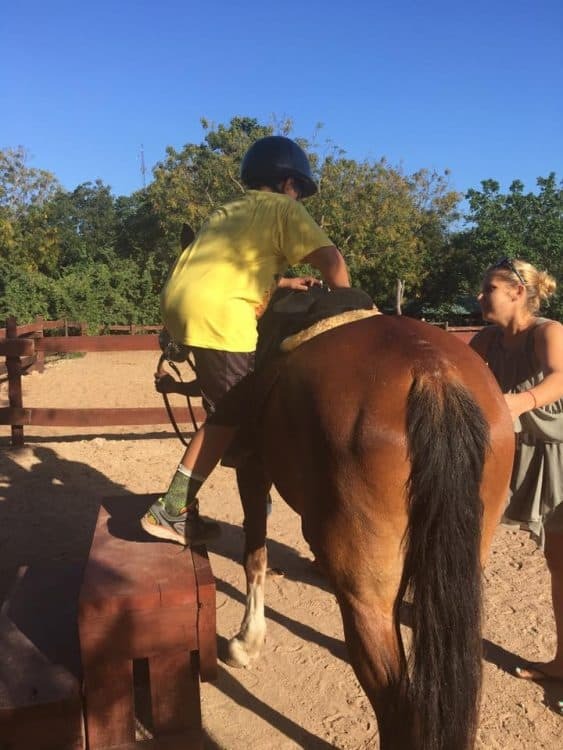 Horseback Riding – Kinondo Kwetu offered this onsite but I am sure there are other places that have it as well if you decide to stay somewhere else. What you will notice here is there are not a lot of cultural activities. We found it really hard to interact with locals. There were excursions to a fisherman village offered from The Sands and maybe if I would have dug deeper the opportunities would have been there. I didn’t feel comfortable going outside the resorts alone as they were quite a walk from any shops or roadside restaurants. You also should plan to have cash on hand if you’ll want it to buy anything. At the resorts it’s fine to charge but everything else works on a cash basis. There were no ATMs’s nearby and it would have been a $20-$30 taxi ride to the nearest ATM for money. 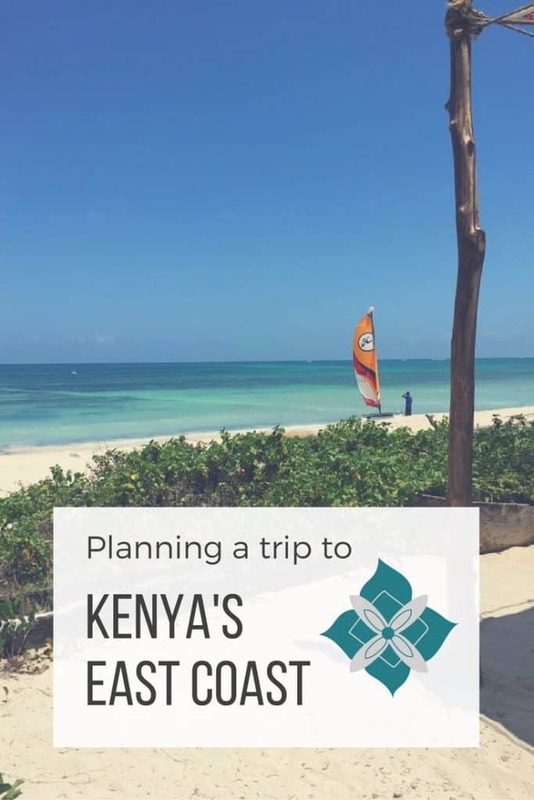 If you’re thinking of visiting eastern Kenya we hope this post gives you some ideas! 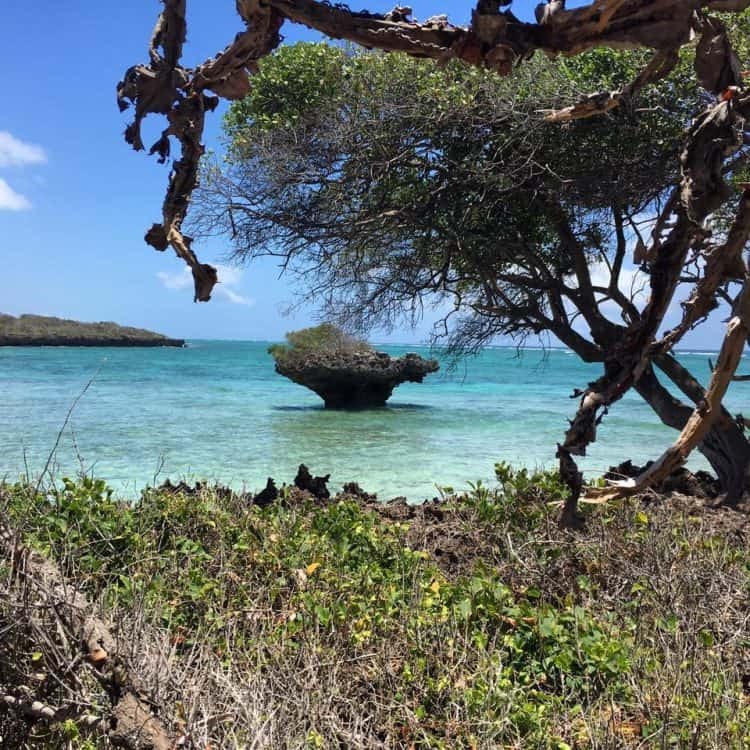 With average ocean temperatures rarely dropping under 26 degrees celsius at the Kenyan coast the year round conditions for swimming are magnificent.